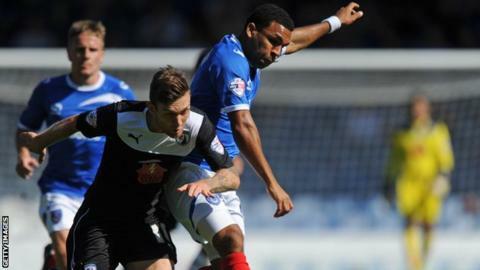 Portsmouth's Andy Barcham says he is happy to play in an unfamiliar wing-back role to get first-team football. The 28-year-old, who has played 15 times this term, is usually a winger, but started a new role for the reserves in Tuesday's draw with Bournemouth. Pompey have moved to a 3-5-2 in recent weeks, prompting the position switch. "I've got to try to adapt and show what I can do. It was a bit different for me but a very useful experience," he told BBC Radio Solent. Barcham has struggled to hold down a starting berth this year, but he thinks his skills as a winger will help in his new spot. "First and foremost with a 3-5-2 we're looking to stay strong and solid and then get forward, so it helps to be an attacking full-back." Meanwhile, 18-year-old midfielder Ben Close has joined Poole Town on a one-month youth loan. Close has appeared in six games for Pompey this season since making his debut in a Johnstone's Paint Trophy tie with Yeovil in September.